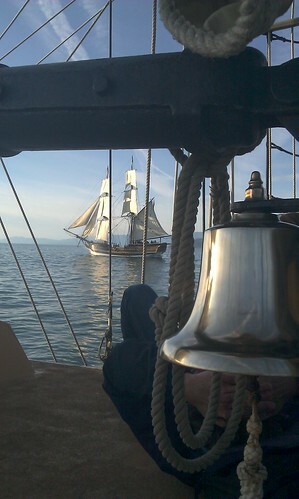 We followed another tall ship, the Lady Washington, out of Ventura Harbor. I had never sailed out of the harbor before. I had always taken power boats, so the slow diving of the ponderous ship into the wave troughs took me by surprise. It was so quiet and so slow – the ship felt much more like a part of the ocean than power boats ever do. The crew is made up of about 10 volunteers, most quite young, who dress in period costume and scramble about the ship, obeying and echoing the captain’s mysterious instructions like “Haul the yarples!” and “Belay the boomfers!” (ok, he never said that, but that’s what it all sounded like to me). Those big ships take a lot of sailing, so things were constantly getting furled and unfurled, raised and lowered. As a passenger, I was just generally in the way, except when a crew member asked me to hold a line, which I agreed to do. 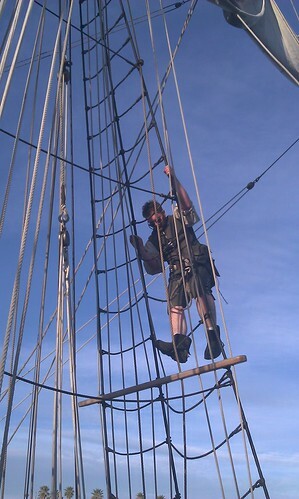 Then I discovered that she hadn’t said “Hold” but “Haul.” Haul means pulling as hard as you can, which I did until I was tired – when the sail was about halfway down and someone had to come to my rescue and finish the job. I’ll never be a pirate at this rate. The reason we had to sail so hard was not that we were going anywhere particular, but because we wanted to be in position to shoot cannons at the Lady Washington (and them at us). Not cannon balls, just blanks, which still make a hell of a noise, a huge cloud of smoke and a 3-foot flame. A direct hit is measured by the sharp crack of an echo coming back from the other ship. No ships are sunk in the process. 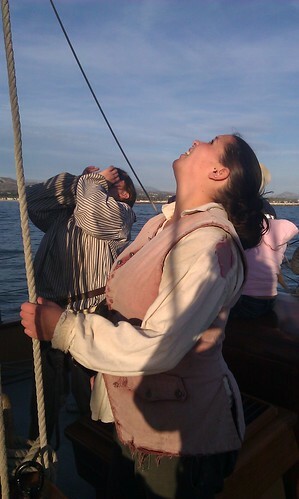 I hear the Superbowl was a good game this year, but it really can’t compete with sailing around in perfect weather with cannons being fired at you. Highly recommended. I would like to feel what it feels like to be on a boat that’s quiet and slow, like part of the water. It was interesting, but I think I like going fast better. I’ve always liked speed! very cool! i took a ride last fall on the ‘windy,’ which is docked at navy pier in chicago but they use engines to get out and back. the sail part is very short. They did use engines to get in and out of the harbor. The sail part was actually a little long for me (3 hours) since we really weren’t going anywhere, just following each other around and shooting. I’d love to go on a trip on one, though.